If there is ever a heaven on earth, it’s here, it’s here, it’s here. These were the words used by the Mughal emperor Jahangir in the 17th century to describe the beauty of Kashmir. This statement holds true for a person who has visited Jammu and Kashmir. The mountains covered in snow, the seamlessly flowing river, the smell of fresh air, and the relaxed attitude of the warmhearted people makes one realize that a totally different place exits along with the fast moving, crowded, polluted cities. 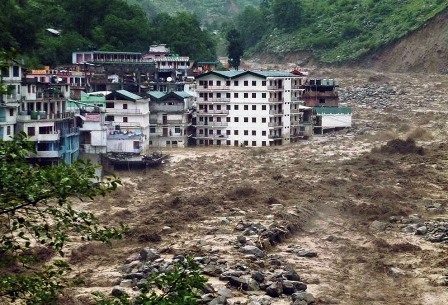 However, the face of Jammu and Kashmir has changed completely after it was struck by the floods in September this year. The flood killed 281 people,affected a total of 5,642 villages and 12.50 lakh families and a loss of Rs.100, 000 crore was suffered by the state. The story is repeating itself again and again, while this year it is Jammu and Kashmir and Assam, last year it was Uttarakhand and before that Bihar. Other places in the country this year are facing a consequence of a deficit monsoon with large areas left uncultivated in the Kharif season. Many parts of Maharashtra, Uttar Pradesh, Madhya Pradesh, Rajasthan and Gujarat are likely to face a decline in agriculture productivity in the winter season as well. The frequency and intensity of nature’s fury is growing every year. All these incidents simply underline that the Climate is changing and it is changing the face of India very drastically. Climate change is one of the greatest threats facing India because its economy largely depends on climate sensitive sectors such agriculture, fisheries and forestry. The consequences of climate change threaten to affect food security, water security and energy access. Coupled with short sighted and siloed decision making and action that has characterized our national development planning are now threatening to wash away benefits of economic growth, industrial expansion and human development. Environmental issues require urgent attention and India has to lay stress on both development and climate resilience simultaneously. People will have to adapt themselves to the changes in their environment, farmers will have to be trained to choose crops that thrive in hotter less moist climates and buildings and homes will have to be designed to deal with warmer temperatures. The consideration of potential risks, the strategies to tackle these risks, will have to be embedded into everyday decision-making right from the local level to the national level. TARAgram Yatra 2014 will focus on the need to systematically assess and incorporate information and measures related to climate risks and vulnerabilities into development policies, plans, institutions, programs and projects. ‘Mainstreaming climate change concerns into development planning’ will help in multiplying the existing technical, human and financial resources; enhance capacity to identify trade-offs between adaptation needs and other priorities and greater cost-effectiveness.